The St Vincent’s Castleknock College Student Council was founded in order to provide an effective and united system of student representation within the college and to give all students the opportunity to make a difference and improve their school. 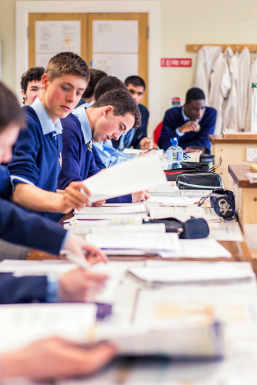 The Student Council itself is established under Section 27 of the Education Act and is under the direction of the St Vincent’s Castleknock College Board of Management. To act as a means of communication between the student body and the staff of the college. To have a real input into decisions being made regarding the college and its students. To further improve the college as a whole, making it a better place for both students and staff. To provide an environment whereby a student can raise any issue in a non-judgmental and free manner with any member of the Council. To inform all students of its activities and those of the college. To lobby the students and the administration of the college. To abide by the European Students Rights Charter and the St Vincent’s Castleknock College Constitution. Meetings of the Student Council are held once a week, usually during lunchtime. These give the members of the Council the opportunity to raise any concerns or ideas regarding issues within the college. Any issues deemed to be of significant importance are brought to the attention of the Headmaster who meets with the President, Vice-President and Secretary every two weeks. Updates are released to the student body on a monthly basis via a bulletin placed on the Student Council notice board. At the conclusion of every academic year a new President is elected who comes from that year’s Student Council. He is then responsible for organising the election of the new Student Council the following year. From first to third year, each class holds an election to select a representative from those who put themselves forward. In transition, fifth and sixth year there are four elected representatives from each year. There is also a college prefect representative and it is custom and practice that the house captain holds an automatic position on the Council. Elections take place at the end of September and the Council is normally in place by mid-October.